The DIY spirit of the Northwest is what makes our artistic community so unique. 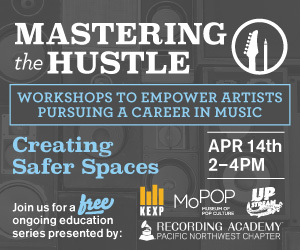 As part of our commitment to supporting the sound and culture of the Northwest, KEXP, Upstream Music Fest + Summit, MoPOP, and The Recording Academy are partnering to offer Mastering the Hustle, a series of ongoing workshops to help emerging artists navigate the music industry. Artist-centric programming is a cornerstone of all three organizations, and Mastering the Hustle will bring local and national industry experts straight to emerging artists, providing them with valuable information to help further their career. We want to provide emerging artist the tools and support they need to find success; however, you define it. Whether it's packing out shows or getting airplay, this series will provide you with the resources you need. The sessions will include speakers from across the music industry and collaborative workshops, focused on supporting emerging artists at every level of their career, especially those interested in pursuing music at a professional level. These workshops are FREE, All Ages, and open to the public. Please note that RSVPs do not guarantee entry. Admission is subject to venue capacity and is first come, first served. In our first workshop, we invited a panel of Seattle musicians and music industry professionals to give presentations on building your music brand. Megan Tweed of Edelman and Assembly PNW Digital talked about the importance of conscious branding. All four members of the band Thunderpussy and Tacocat bassist Bree McKenna shared their firsthand experiences, both successes and pitfalls, of figuring out their bands' unique image and style. Plus, Sub Pop Records CEO Megan Jasper talked about the music business and some of Sub Pop's diverse and uniquely branded acts, as well as the label's brand itself. In our second workshop, we invited a panel of Seattle musicians, bookers, and engineers to discuss how artists can improve their sound and performance. Local rapper Grieves and his tour manager Colin Papworth discuss how to handle logistics of a show and how to level up your performance. Crocodile Production Manager Shaina Foley walks through the crucial advancing process and communicating with the venue. KEXP Audio Engineer Julian Martlew discusses how to best do your soundcheck and communicate with the sound person during the show. Moderator and Upstream Curator Meli Darby directs the conversation, offering insights from her own booking experiences. For anyone who's played music in the past couple decades, you know how much the industry's changed and how hard it can be to generate an income from your music. However, it's not impossible. We assembled a team of experts to help shed light on how to protect your music and collect royalties. We invited a panel of industry professionals to break it down, including Member of Washington Lawyers for the Arts and IP Team Leader at Cairncross & Hempelmann Jeff Nelson, Executive Director at CASH Music Maggie Vail, and Wade Metzler who does Artist and Industry Relations at SoundExchange. Live performance is one of the most immediate ways to engage with music. It helps build a bond between yourself and your fans. It can lead to life changing moments on both sides of the stage. So, how do you get booked to make it all happen? In our fourth installment of the Mastering The Hustle workshop series, we invited a panel of Seattle booking and promoting professionals to speak on the ins and outs of getting booked for a show, including Q Night Club and Upper Left Events’ Sean Majors, The Vera Project’s Andrea Friedman, Neumos’ Evan Johnson, as well as KEXP and False Prophet’s Sharlese Metcalf – all moderated by KEXP's Morning Show host John Richards. Just in the Northwest alone, we’re host to numerous festivals that range from big budget productions to DIY experiences. Getting booked is a goal of many artists, but how do you make it happen? And how do you make your set memorable once you get on stage? Seattle musician Grant Eadie, who performs as Manatee Commune, kicked things off with his experiences getting booked and playing festivals. Later on, KEXP DJ Troy Nelson (who also helps book West Seattle Summer Fest) lead a panel discussion with Sasquatch! Music Festival’s Adam Zacks, Upstream Music Fest’s Meli Darby, and Capitol Hill Block Party’s Eli Anderson. Being a successful musician, whether locally or internationally, means knowing the ins-and-outs of getting your music into the ears of the people who it will best connect with. From social media to press releases, how do you get your music from Pro Tools on your home computer to local stages and featured on blogs? Seattle songwriter and rapper Sassyblack, Sub Pop’s Manager of Social Media Content + Strategy Rachel White, BuildStrong Music and Do206’s Austin Santiago, and SoundGig Presents’ C.J. Frederick all discussed ways they’ve promoted themselves and other artists on a panel moderated by KEXP’s Greg Vandy, host of The Roadhouse. In the seventh installment of the Mastering the Hustle workshop series, several Seattle-based luminaries were invited to discuss the essential component of finding ways to make more money as an artist as well as what artists can do to earn income on their way to becoming full-time creatives. Gigs4U’s Ramona Grotte, Artist Home founder Kevin Sur, The Noise Complaints Group co-founder Kit Russell, and Seattle singer/songwriter Kris Orlowski gathered to discuss various topics surrounding ways artists can better ply their trade on a panel moderated by City of Seattle Office of Arts and Culture director Randy Engstrom. In the eighth installment of the Mastering the Hustle workshop series, several members of Seattle’s community convened to discuss the importance of safer spaces and what we can do to make the spaces in our city safer. S. Surface, architectural designer and curator of The Alice, Kate Becker of the Seattle Office of Film and Music, Ta Pemgrove, interim executive director for Proper Groove, Kitty Wu, co-director of 206 Zulu, and Matthew Richter of the Seattle Office of Arts and Culture gathered to discuss all aspects of safety when it comes to the spaces where members of our community assemble, and ways we can help maintain that safety. In the ninth installment of the Mastering the Hustle series, a panel of longtime music and healthcare professionals came together to discuss the pitfalls of not leading a healthy lifestyle as a musician and ways to reverse course from the habits which lead to a musician to poor physical and mental health. In a panel moderated by KEXP Morning Show host John Richards, Ian Moore of SMASH, MusiCares’ Erica Krusen, Dr. Brenna Regan of the Bastyr Center for Natural Healthand Seattle Nature Care Clinic, Faustine Hudson, drummer of the Maldives discuss their experiences, opinions, and helpful advice regarding health and self-care in an industry where both are largely considered an afterthought. About KEXP KEXP is a music-focused nonprofit arts organization serving music lovers and artists through in-person, broadcast, and online music programming. KEXP operates one of the most influential listener-supported music radio stations in the country, KEXP-FM, Seattle. More than 200,000 listeners from around the world tune in to the station each week over the air and online. On KEXP's YouTube channel, videos of exclusive in-studio performances garner more than 2.4 million views per week. KEXP produces hundreds of live performances each year, many of which are open to public audiences at no charge. For more information, please visit kexp.org. About MoPOP The Museum of Pop Culture is a leading-edge nonprofit museum, dedicated to the ideas and risk-taking that fuel contemporary popular culture. With its roots in rock 'n' roll, MoPOP serves as a gateway museum, reaching multigenerational audiences through our collections, exhibitions, and educational programs, using interactive technologies to engage and empower our visitors. At MoPOP, artists, audiences and ideas converge, bringing understanding, interpretation, and scholarship to the popular culture of our time. About The Recording Academy Established in 1957, The Recording Academy is an organization of musicians, songwriters, producers, engineers, and recording professionals that is dedicated to improving the cultural condition and quality of life for music and its makers. Internationally known for the GRAMMY Awards — the preeminent peer-recognized award for musical excellence and the most credible brand in music — The Recording Academy is responsible for groundbreaking professional development, cultural enrichment, advocacy, education, and human services programs. The Academy continues to focus on its mission of recognizing musical excellence, advocating for the well-being of music makers, and ensuring that music remains an indelible part of our culture.